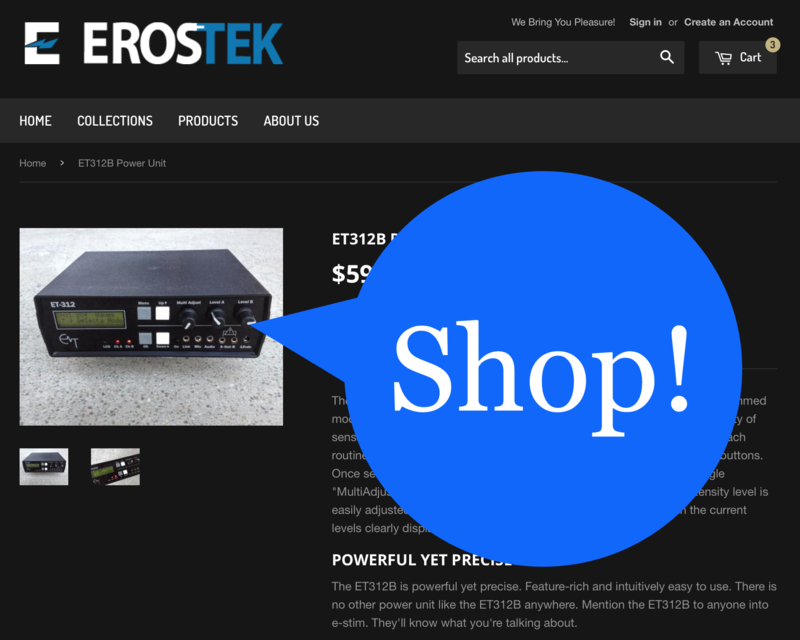 An ET312B Repair Service for EU Customers is now available from Blackstore.ch! You can find our more about their service by visiting the Blackstore ET312B Service page. – Includes mounting bracket and instructions. – Replace if output levels become erratic or unreliable. – Replace whenever battery fails to charge. – Connecting the wrong AC adapter is a normal cause of failure of this IC. – Observe ESD precautions for handling static-sensitive components. – Replace both to resolve “Failure 20” errors. For the more parts, visit our Spare Parts section. I’m not sure how to connect my ET-312 to my computer? Solution: Read our post: Installing ErosLink on Vista. I have questions about how to use the ErosLink software? Solution: An online ErosLink User Guide is available. I lost the remote control to my remote unit. How do I get a new one? Solution: SexTek normally stocks extra remotes. I lost the AC Adapter for my unit. How do I get a new one? Solution: SexTek can normally supply AC Adapters. Do not use any other adapter without checking with SexTek first. You may cause serious damage to your unit. My ET-312B (or ET232) works great while connected to my portable CD player but how do I listen to the music at the same time? Solution: Some portable CD players have a “line” output as well as a headphone jack. Simply connect your ErosTek unit to the line output and use your headphones as usual. If your player only has a headphone jack, you can get a “Y” cable locally to allow you to plug both the headphones and your ErosTek unit at the same time. You can use the same trick with your computer’s sound output. How do I connect your product to a home stereo system? Solution: The best way is to use the “Tape Out” or “Tape Record” jacks. You will need a (widely available) cable with RCA plugs on one end and a 3.5mm plug on the other. I tried connecting my CD player to the audio input and it doesn’t do anything. Solution: The cable should be plugged into the headphone or line output of your CD player. Try turning the Multi Adjust control all the way up. Try increasing the volume on your CD player. Some CD players have a volume limiting feature that should be turned off. Finally, some CD’s (especially classical ones) have an extremely wide dynamic range. It is normal for the quieter passages on these recordings to not cause any stimulation. Most people find pop or dance music works best. The output of my unit is erratic or unsteady. Solution: This is likely due to a bad cable or connection. With use, the cables do wear out and can develop an intermittent connection–especially at the banana plugs. Try a different cable and/or accessory and see if the problem goes away. With most electrodes, my unit has power to spare, but I can sometimes turn it all the way up with one particular electrode. Is that normal? Solution: A few different things might be happening. First, most electrodes must be damp or wet when using them. Ideally, you should use a conductive gel designed for e-stim (TENS) use. Dry electrodes will not work properly. Second, if you’re using our new ET-312, make sure the Set Pwr Level? menu option is set to the Normal or High level. Finally, certain electrodes made of conductive rubber materials have a high internal resistance. This makes the sensations less intense with these electrodes regardless of what type of e-stim unit they’re connected to. It’s a limitation of the electrode design. If you don’t see an answer to your problem above, please check our Frequently-Asked Questions or Repair category for additional information and assistance. You can also reach our Customer Support department too.